Vermeer has already proven that he is a master painter. he can paint anything perfectly. Here he paints very little, and it is not perfect. There are not details and the lines are not clean. Vermeer is perhaps trying to get us to stop looking so much with our eyes and look more with our hearts. What is it that he wants us to notice? The girl is beautiful, but that answer is too simple. What about her is beautiful? What is the value of beauty? We thought it might be something bad. There are no details. Maybe the details don’t matter: her name, her interests, her life. We don’t care about her, we just want to look at her. She is a thing. A pretty thing. We thought it might be something good. There are no details. The girl is beautiful. She doesn’t have to be rich, or famous, or have good hair. She just has to be herself. That’s enough. That is beautiful. Those are some things that we thought. ​Vermeer, J. 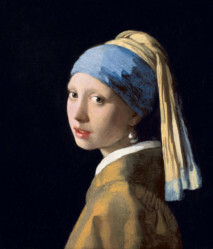 (1665) Girl with a Pearl Earring. Mauritshuis, The Hauge.